FACS analysis of murine peripheral blood leukocytes. (A) After lysis of red blood cells, leukocytes were stained with antibodies specific to 7/4 and Ly-6G to reveal a population of pure monocytes (7/4briLy-6G–), a population of pure neutrophils (7/4briLy-6G+), and a mixed population of monocytes, T cells, and B cells (7/4dimLy-6G–). 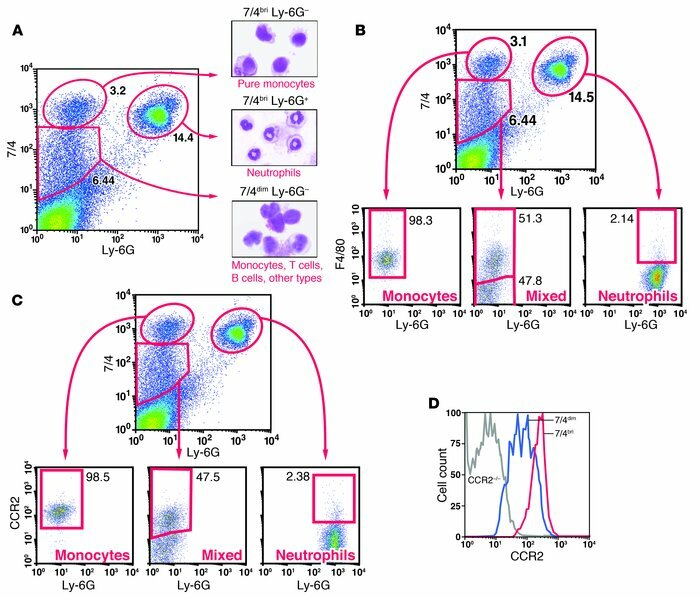 (B and C) Expression levels of F4/80 (B) and CCR2 (C) on populations of monocytes (7/4briLy-6G–), neutrophils (7/4briLy-6G+), and mixed leukocytes (7/4dimLy-6G–). Gates were set so that no cells were included in the absence of the primary antibody. Numbers are percentages of total leukocytes in each population. (D) Expression of CCR2 on monocytes (7/4briLy-6G–) and mixed leukocytes (7/4dimLy-6G–).